I was fooled once before by Art of Trance. In the 1990s and the early 2000s, Art of Trance — also known as Simon Berry, head mookymook of Platipus Records — released two great albums and a string of awesome tunes, all pulling from acidic roots. Somewhere along the line, the art was waning, it was fading, it was getting lost somewhere, culminating in Ultrafoxx, the 2016 release that I considered to be among his weakest yet. 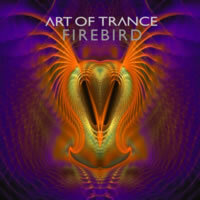 After a long foot-tapping wait, Art of Trance re-emerged in November 2016 with "Firebird", hopefully titled such to be comparative to a phoenix rising from the ashes. First in the full package is the Original Mix, starting off with a rather faded, space-laden atmospheric opening. This could get good. The beat hits, and soon enough, in rolls Art of Trance's classic acid synth, like clockwork. It wouldn't be an AoT release without it. It's slow, it's a little bubbly, and it rolls along like a caramel river. (Strange analogy, indeed.) I worried that this would be the pinnacle, but the synth does sharpen from time to time, and that energy alone feels good in the ears. A faint yodel can be heard in the distance. There are undertones of lovely arpeggiation that fail to meet their full potential; in fact, it sounds off-beat and, as a result, just plain off. Though there's definitely an atmosphere here, Art of Trance isn't displaying the genius they once embodied, once again relying on the sound itself rather than actual content and melody. Mr. Berry invited a few friends along to see what they could muster with his creation. The Croatian Petar Dundov Remix adds a slightly wider bass and a new salt shaker effect into the mix, but he doesn't stray far enough. Granted, his take on the acid bass "melody" is a bit more lively, but it's really not enough of a remix to warrant mention. The subsequent Jonno Brien Remix makes more pronounced use of the wickedly strange arpeggiation by bringing it more into the foreground, but like Petar Dundov, he really isn't sure how to take this material in a new direction. Instead, it's a different beat and a new bassline, but it's the same concept retreaded with a slightly modified set of tires. The new beat DOES give it a more clubby kick, though, which could put it in greater favour with DJs. Gai Barone, who previously submitted two remixes to the Ultrafoxx package, is back with — you guessed it — the Gai Barone Remix. I like this one more from the get-go, as its atmosphere is soft yet deep. It sounds practically new. Pushing a bassline similar to the original but with greater depth, we could finally be up against something. Barone sneaks in the yodels from before, but they are subdued in favour of a few new gossamery, natural sounds here and there. Several notable analog jabs later, and we're back to where we were: the bassline drives the mix, the arpeggiation is in the background but never enters the forefront, and all the other random sounds solidify the mood. Gai Barone didn't create anything that I'll remember the next day, but there's something creepy about his mix that will haunt me for days. To conclude, Art of Trance offers his Phoenix Soaring Mix, which is a very, VERY, VERRRRRY ambient version of his original track. Filled with angelic pads and pretty much nothing but for the majority of the time, there are even moments where you swear nothing is actually changing, and your audio player is on the fritz. Certain elements make a return, including the "yodel" hollering of a foreign figure and the still off-putting twinkling arpeggio, but mostly, you can expect one of the most ambient and event-free tracks I've heard in ages. Great, if sleep is your goal. So, let's summarize: the original isn't particularly spectacular, although it would make for a decent chillout track if ever the mood strikes. The remixes fail to take Firebird in any direction that would be considered a notable change or contribution. And his Phoenix Soaring Mix is, without a doubt, what I'd call a "sleeper hit". That is, it'll put you to sleep with its impressive blandness. All in all, this is another example of his original sound lost and softened to the point where his productions no longer have the impact of those from over two decades ago. His instruments used haven't changed much over the years — acid remains the strongest influence — but his use of melodies have taken a backseat to using audio for audio's sake alone. That may be okay for some, but I do believe substance is complementary to style. Remember, Simon: a good melody goes a long way.